We find the 2011 edition of Session Victim in fine form after releasing an array of distinct and unconventional music on Real Soon, Delusions of Grandeur, Morris/Audio, Wolf Music, and Retreat. Session Victim boast a distinct production method, thriving on speed, spontaneity and methodological sample harvesting. With a performance direct from the heart, and two decades of friendship playing a vital role in creating, encouraging and fortifying this musical union – eyes down, hands in the air, no retreat no surrender. This May will see their inspired and long gestating single ‘Right From Wrong’ on air london, and further unique releases are slated to arrive on their home labels Delusions of Grandeur and Retreat. In addition, expect to see Session Victim live appearing soon – a two-man blood, sweat and no tears show which they have been meticulously tweaking over the last year. 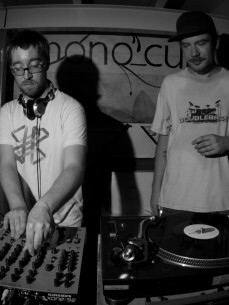 As DJ’s they have already travelled the length of Europe, unleashing their inspiring style of performance on the most particular of audiences including Ego in Hamburg, Tape in Berlin, Zukunft in Zurich and various underground warehouse parties in London. In late 2010, Session Victim also completed their first Australian tour, showing there are no boundaries when it comes to the appreciation of their music.